How much power is necessary for most kinds of music given an average-sized room? Well, the Consonance Cyber 10 Signature offers just 11 watts RMS at 1kHz, with harmonic distortion rated at about one per cent at seven watts. Frequency response goes from 6Hz to 60kHz (-3dB) at eight watts output and a signal to noise ratio of 87dB is claimed. Input sensitivity is 180mV. These are certainly decent figures, although distortion levels are higher than a typical solid-state design. Of course, choosing a big, powerful amplifier – one with sufficient output to meet whatever demands we make of it – is eminently sensible. But some low-powered tube amplifiers, like the Cyber 10, promise a certain extra 'something' that bigger, more powerful solid-state designs just can't equal. The Cyber 10 is a revised version of the original model and features four 2A3 Triode output tubes, two 5AR4 valve rectifiers, as well as two 12BH7s and a single ECC-83 tube. Improvements include higher-grade capacitors, hand-wound transformers and valve rectification in the power supply. In terms of features and facilities, the Consonance keeps things simple. There are five unbalanced analogue line inputs and a single unbalanced analogue line output. The transformer-coupled loudspeaker outputs cater for impedances of four or eight ohms and volume levels can be adjusted via a remote handset. To improve performance, Consonance uses AC voltage for the tube heaters, rather than DC. While this risks the possibility of hum pickup, voltage levels have been kept low (2.5V) to avoid this. Moreover, each output tube has its own 'hum pot', which allows individual adjustment for minimum noise. Given that low-powered amplifiers tend to be used with speakers having a sensitivity of around 94dB/W or greater, residual noise can be an issue. But even partnering this amp with loudspeakers in the 99dB/W range failed to reveal any audible hiss or hum. It's a very quiet and noise-free unit. The Cyber 10 offers excellent build quality, with beautifully finished brushed-aluminium metal work over a steel chassis and smart wooden trim. The unit is solidly made, weighing in at about 25kg. The mains and loudspeaker output transformers are located towards the rear of the unit, with the tubes at the front. 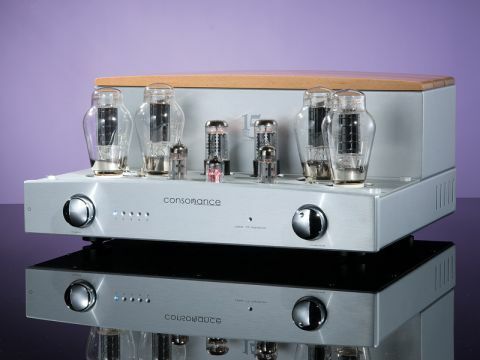 For those who might feel anxious about having hot tubes exposed, Consonance provides a ventilated steel cover that encloses the valves and prevents damage. It does the job, but its squared-off 'boxy' shape interrupts the gentle curve of the front panel and wooden top section, and (for us) slightly spoils the look of the amplifier. Internally, the amp is a mix of hard-wiring and printed circuit boards. Layout is neat and uncluttered. Our review sample came fitted with Chinese-made Electron 2A3 triodes and Full Music 12BH7s. A Slovakian ECC83 and Russian-made Sovtek 5AR4s completed an all-star international line-up. We partnered the Cyber 10 with Consonance's CD2.2 Linear Mk II – a wonderfully natural-sounding AA filterless CD player that matches the amplifier in terms of styling and sound. The first thing that grabbed us (after a few days spent running-in the electronics) was its smoothness and refinement. It delivers a very beguiling sound that's warm and relaxed, yet at the same time detailed and incisive. It has a velvety smooth, almost liquid sort of presentation, but isn't lacking in immediacy or impact. Given that it only offers 11 watts, the Cyber 10 sounds amazingly big, solid, and powerful. Surprisingly gutsy, it's definitely an amplifier that punches well above its weight. Listening to it is pure pleasure – it manages to charm and excite in equal measure. But, be warned: to obtain the best from this amplifier, you need sensitive loudspeakers – probably around 94dB/W or higher. Obviously, this figure is a generalisation – much depends on the size of your room, how close you sit to the speakers, the kind of music you prefer to listen to and how loud you like your sound. But, the more efficient your loudspeakers are, the more dynamic headroom you'll have for difficult demanding music with loud peaks. Bass and treble extremes are well balanced. The top end is crisp and articulate, yet never 'leads' the mid-band or bass. Overall, the sound is beautifully integrated and homogenous. Bass sounds full and firm, with good depth and a proper sense of power and weight, while the mid band is smooth and accomplished Played within its power compass, the sound is relaxed and refined – so much so, it comes as something of a shock if/when you play things too loud and suddenly the amplifier hits the buffers and runs out of steam. Fortunately, the 'end stop' has a nice fat cushion that helps soften the blow, disguising what's actually happening, if at all. When you push the amp very hard, the resulting congestion and compression can come as a surprise, because – prior to the moment of distress – everything sounds so very comfortable and relaxed. And, ironically, the kind of sound this amp produces – smooth, clean, natural – almost invites you to listen loud. The Cyber 10 offers users the choice of four- or eight-ohm loudspeaker outputs. The 'correct' output is the one that sounds loudest – indicating an optimum impedance match. However, it's often the case that the four-ohm setting delivers a slightly darker more controlled end result – albeit, with some loss of power. We tried both outputs with a pair of Impulse H1 horns and settled for the eight-ohm tap. For some reason, the sonic difference between four and eight ohms isn't as big as it sometimes can be and we, therefore, felt it best to have maximum power. However, do sample the four-ohm tap – even if your speakers are nominally eight ohms. Being transformer-coupled, the Cyber 10 has a fuller, 'fatter' bass than many direct-coupled solid-state amplifiers. You don't get lean super-tight, ultra-controlled low frequencies with this amplifier. Instead, the bass has a looser 'breathier' quality; not 'loose' in the sense of flabby, but nicely rounded, warm and relaxed. The amplifier produces a satisfying room-filling sound with all types of music. The performance is crisp, open and well balanced. with excellent 'scale' and dynamics. Having encountered the original Cyber 10 some years back, we'd unhesitatingly say the new Anniversary edition offers a worthwhile improvement. The Cyber 10 is an outstanding amplifier. Most listeners will quickly fall in love with it – just as we did! It does have limitations in terms of maximum power output and these need to be considered before purchase. But, providing your loudspeakers aren't too insensitive, there should be few problems. It's a sad fact of audio life that this sort of sonic alchemy and high-output power, are not easy to achieve simultaneously. Ultimately, you have to compromise. For head-bangers with a taste for loud music, the Cyber 10 is probably not a wise choice – unless, of course, ultra-sensitive speakers are used. But if you want something that's beguilingly refined, with a liquid smoothness that caresses the ear, yet offers crisp attack, then this really is an amplifier you must hear. But, be warned; it's a very tough act to follow. Once you experience what it has to offer, it might not be easy to find something better.